So, when we last left The Rambling Jour, I was causing trouble in Monocacy and charming the fine gentlemen of the Shocker Mess. Prior to that, however, I had a wee bit of health issues. Spoilers: I’m fine now. Before being fine, I was having heart palpitations and chest pain. I attributed this to the fact that I sit at a desk, hunched over paperwork all day long, and I hold a lot of tension in my chest. The heart palpitations were more of a concern, because my heart would just start to race and pound really, really hard. And really, really fast. Things first started to go wrong for the doctor’s appointment when I a) left work twenty minutes late because a meeting ran long, b) hit an insane amount of traffic, which resulted in it taking me an hour and twenty minutes to get to the doctor. I literally arrived at the appointment the second it was supposed to start. Needless to say, I was a bit on edge. Then the doctor was running late. Fine, fine, whatever. I’d brought a notebook and a pen with me (because I never move twenty feet without bringing a notebook and a pen with me) and started working on my novel. My current historical novel (sorry Random Contemporary II, but historical novel is winning out on word count at this moment in time) deals a lot with addiction, post traumatic stress disorder, and panic attacks. Sitting in a small, stuffy exam room was giving me a panic attack. It was akin to Chekov’s Gun: using everything around me, introducing something small and forcing it into a story line and making it work! No plot device left behind! Experience it–write about it–make it work! In between thinking my heart was going to bounce right out of my chest, I felt like A Real Author. Living the dream! Using my emotion and slapping it down on paper! When the doctor came in, we had a delightful, albeit rambling, chat. And then I had an EKG. And then a second EKG. And then a third EKG. Okay, so what started out as some heart palpitations turned into “well, we can give you anxiety medication but let’s do an EKG first” which then turned into “I don’t think you’re having a heart attack.” I’m surprised that I stayed as calm as I did, but I drove myself to the ER, handed the keys of my vintage 2003 Chevy to the valet parking attendant (“Don’t worry, we validate.”), and strolled into the ER like I owned the place. I got yelled at for accidentally putting the opening in the front. Whatever. Chest pain, remember? This kid makes holter monitor tests glamorous. Low rise jeans. Always attractive sports bra. Heck ya, that’s how a kid on happy pills rolls: Facebook ready, just living the dream. I hadn’t had heart palpitations since I started my meds. 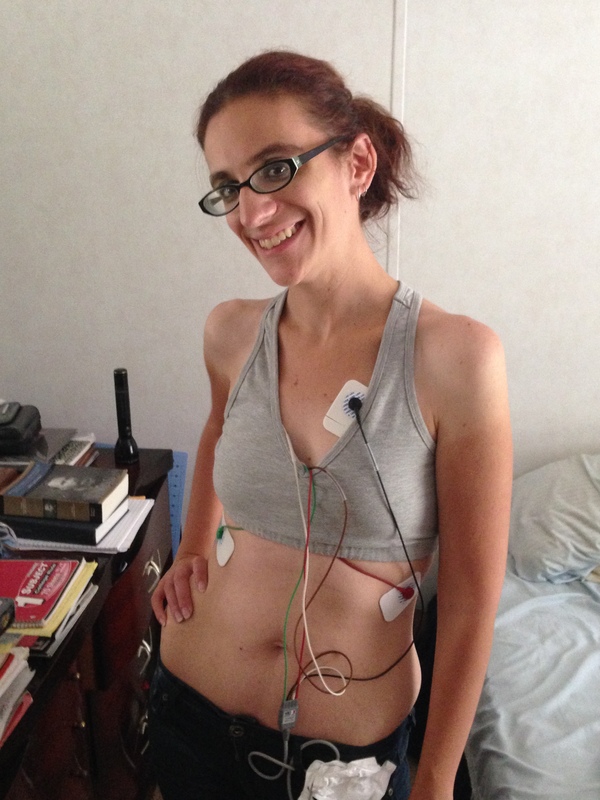 Until, you know, I was wearing the holter monitor and having every heartbeat recorded. Then I had two. So that was nice. The good news is, the results of the blood work and the monitor came back fine. I’m just this much over the line separating normal and crazy. I haven’t been this laid back in years. And I’m using every feeling, every twitch, and every flutter for my novel. Granted, in 1912 we weren’t aware of PTSD and the effects of stress on people. World War I gave us shell shock. But the feelings are there. I know those feelings and I can use it in my novel to better describe what the main character, Ava, is going through. My med-pocolypse will be financially expensive (don’t even get me started), but invaluable for enriching my writing. Right? Right. I’m about 165 pages into my novel–which actually has a title, Since April–so it looks like it’s actually happening. Exciting! Now, if I could only find time to work on it. That’s the one set back to the so-called happy pills: about an hour later, I’m asleep. Of course, that could also be old age setting in. I just recently celebrated the third anniversary of my 29th birthday. So…yeah. Old age, heart palpitations, varicose veins, and asleep before 9pm. Oh wow, that would be so comforting for a doctor to tell you! I bet you were unimpressed with the service fro some strange reason lol. *Hugs* Eep, glad it was all sorted in the end. Great piece. OH MY GOD! I’m so glad you’re okay!!! Please take care of yourself with all your happy pills and take some time to relax! I was on Cymbalta for nearly 3 years because of my fibromyalgia (it stopped working). I was given Alprazolam (Xanax) for anxiety for flying, and then we accidentally discovered if I took that at night, it helped me sleep. Bonus, it doesn’t screw with my writing the way the Cymbalta did. Even better, my doc wrote me a prescription for taking up to 3 of them (.5mg) a day (I usually only need the one at night to sleep, except for today at a friend’s memorial service, when I took two in four hours.) But…yeah. LOVE Xanax. It just takes the edge off stuff when I need it. PTSD survivor as well, not a fraction as bad as it was 17 years ago when I got together with Hubby out of my previous relationship (which was the cause of it). But still trigger sometimes. So hope whatever your on helps. Be very aware that if they put you on an SNRI, or any other drug that interacts with serotonin, read up on serotonin syndrome and make SURE you’re not taking too much of stuff (including natural herbal supplements like L5htp) that can induce it. Given the way this started, I thought it was going to be much worse for you. I’m glad it wasn’t. “I don’t think you’re having a heart attack” isn’t exactly comforting when you’re being sent to the ER. Oh my goodness! I saw this when you first posted it but didn’t get a chance to respond. I hope you’re feeling better! I’m sorry this is all happening but, as Ma Ingalls would say, “There’s no great loss without some small gain.” I guess it can go into your writing…? Feel better!